It is our great pleasure to invite your company to join the conference as a sponsor. Your kind support will be very helpful in raising the standards of research in the field of microscopy. If you would like to support us, simply download and fill the supporting form and email to Dr. Natthaphol Chomsaeng (Email: natthapholc@gmail.com, Mobile Phone (+66) 81-343-0757) Forms and relevant documents can be downloaded here. Organisation’s logo on stage in the conference room. Acknowledgement on the official conference website (http://microscopythailand.org/mst36) with logo and hyperlink to the organisation’s website. Verbally acknowledged with a recognition plate at the official opening ceremony as the gold sponsor. Delegate list (does not include contact details) to be made available as a PDF document emailed prior to the event, as well as a PDF list emailed after the event (Subject to the privacy act). ONE (1) full -A4-page (color) advertising from the organization in the program book. ONE (1) full -A4-page (B&W) advertising from the organization in the program book. THREE (3) full -A4 pages (B&W) technical preview* from the organization in the program book. ONE (1) Brooch on conference bag. ONE (1) booth space at the location preferred by the organisation. FOUR (4) complementary full registration to the conference. *Technical preview is an article that the organization can distribute their latest technologiesor anything about your company to people who attend the workshop. The written text will be printed in Program books as black and white page. The organization needs to provide the information and/or knowledge about new technologies or products. We intend to create this article not for advertisement but for education which will help Microscopy society. This is a good opportunity that the organization will have more space to explain their message to readers. Acknowledgement on official conference website (http://www.microscopythailand.org/mst36) with logo and hyperlink to the organisation’s website. Verbally acknowledged with a recognition plate at the official opening ceremony as the silver sponsor. ONE (1) full-A4-page (color) advertising from the organization in the program book. TWO (2) full -A4 pages (B&W) technical preview* from the organization in the program book. 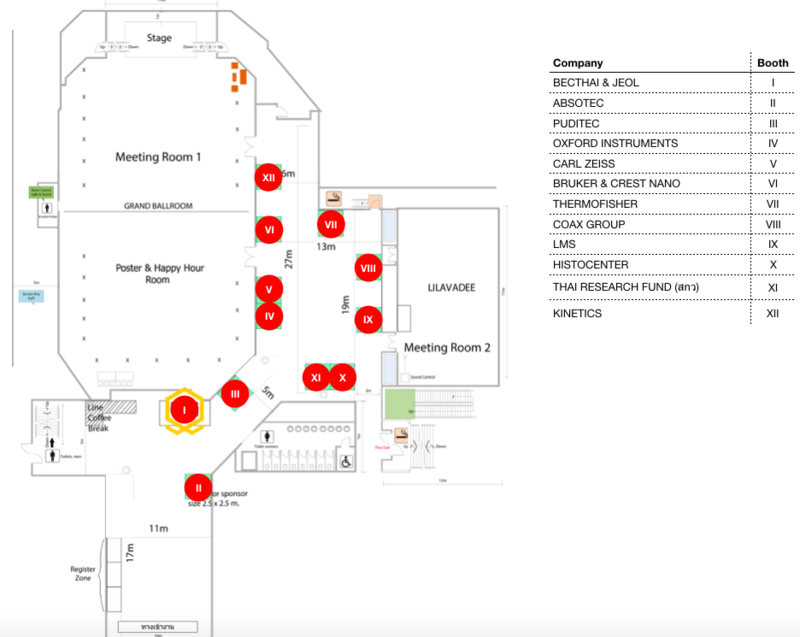 ONE (1) booth space at the location preferred by the organization. THREE (3) complementary full registration to the conference. Verbally acknowledged with a recognition certificate at the official opening ceremony as the bronze sponsor. ONE (1) full-A4-page (B&W) advertising from the organization in the program book. ONE (1) full -A4 page (B&W) technical preview* from the organization in the program book. ONE (1) standard booth at the location preferred by the organization. TWO (2) complementary full registration to the conference. The MST36 Banquet is included in all full conference registrations and promises to be a truly memorable night. Your logo printed on all Banquet tickets & table menus. Opening address by the vendor at the banquet opening. Organisation’s logo on stage at the conference banquet. Verbally acknowledged with a recognition plate at the official opening ceremony. TWO (2) full A4 pages (color, inside front/back cover) advertising from the organization in the program book. FOUR (4) full -A4 pages (B&W) technical preview* from the organization in the program book. ONE (1) booth spaceat the location preferred by theorganization. Opening address by the vendor at the welcome reception. Organisation’s logo on stage at the welcome reception. Acknowledgement on official conference website with logo and hyperlink to the organisation’s website. Free registration for TWO (2) representatives from the vendor attending the conference. Technical seminar will be held during the academic oral presentation. Poster sessions will be held in conjunction with Happy Hour session on Wednesday 27th March 2019, only ONE opportunity for an organisation to hold this event. Acknowledgement on official conference website (http://www.microscopythailand.org/mst36) with logo and hyperlink to the organization’s website. 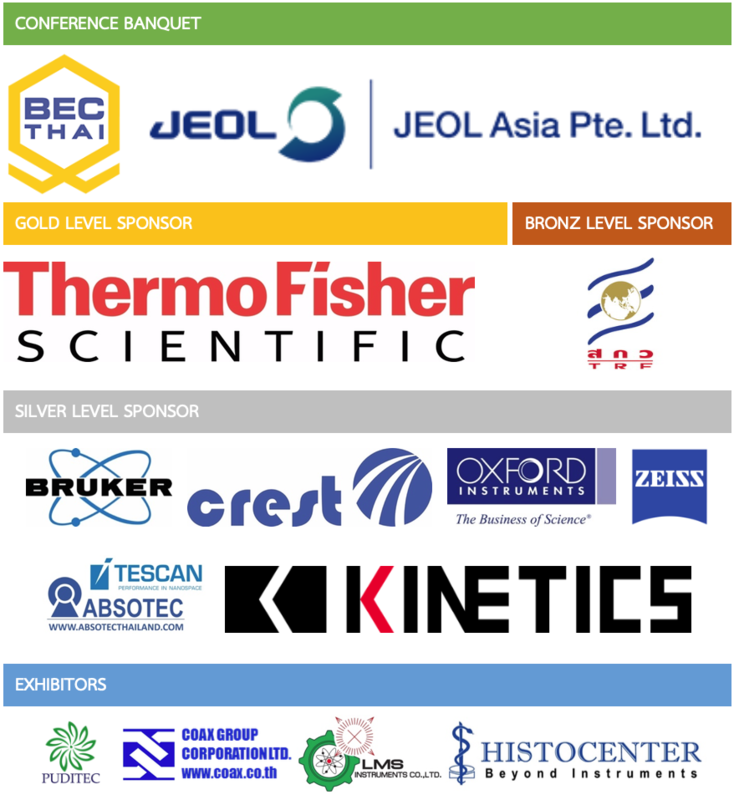 Acknowledgement on official conference website (http://microscopythailand.org/mst36) with logo and hyperlink to the organization’s website. TWO (2) complimentary full registration to the conference(extra exhibitor staff will be registered at full registration rate). The pre-conference workshop will be held on 26th March 2019. Please contact Dr. Natthaphol Chomsaengfor more information at natthapholc@gmail.com. Organization’s logo presented at the Workshop. Workshop delegate list (does not include contact details) to be made available as a PDF document emailed prior to the event, as well as a PDF list emailed after the event (subject to the privacy act). All prices listed in this document are in THAI BAHT. Applications are not considered until receipt of Sponsorship and Exhibition Form. Acceptance of Sponsorship and Exhibition application will be subject to committee approval (please note that the committee reserves the right to decline applications). Payment of the sponsorship fee is required at the time of your booking. Entitlements may not be fulfilled if the payment has not been received. The conference committee and the organizers will take the uttermost care to fulfil all listed benefits. Concern that benefits have not been met must be advised in writing to the conference secretariat prior to the event. All advertising materials and artwork must be provided by the sponsor at the sponsor’s own cost. The sponsor is responsible for any displays and banners supplied and erected at the conference. Inclusions in the conference print material may be forfeited if sponsorship is not confirmed and payment received prior to printing deadlines. Sponsors are responsible for the security of their own equipment and materials whilst at the conference. Exhibition space will be allocated depending on the sponsorship packages and on a first come first served basis. Conference organizers have the final say on all booth allocations. If the Sponsorship or Trade Display Package can be resold to another company, the company will receive a full refund, less 50% of their deposit. If not able to be resold, the company will be liable to pay 50% of the total Sponsorship/Exhibition fee. This applies to the cancellation request received in writing prior to 15th December 2018. Any cancellations received after 15th December 2018 forfeits 100% of their deposit. Any refunds of deposits paid will be made after the Conference. All bank charges, including senders and receiver’s charges, resulting from a refund related to cancellation of a sponsorship/trade display items will be passed on to the sponsor/exhibitor.